With technology an increasingly present aspect of life, we’re always interested in the strides being made to make it more accessible to young children. Here is an innovation by a company searching for ways to combine traditional toys and modern gaming technologies – to bring the action off the screen and back into the physical world. 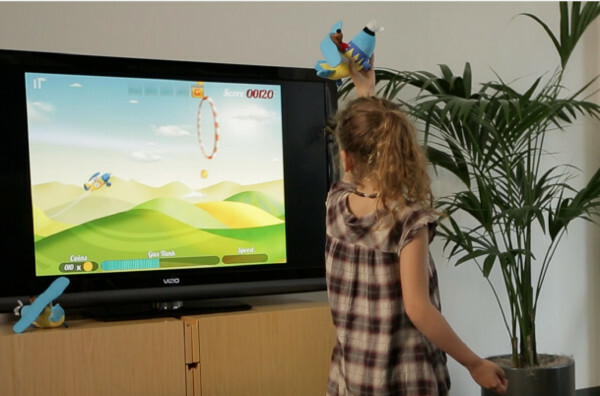 It’s the Tiny Plane game controller from Zow Pow Toys, a plush toy remote which is a logical next step from motion sensitive game controllers like the Nintendo Wii and Xbox Kinect. Motion sensitive game controllers have opened up the world of computer games and educational technologies to younger and younger children, but with a three-year-old in my house who would love to play the occasional game with her older brother and sister, the standard remote control is still far beyond her ability to work. This can lead to tears, so I was fascinated to see this innovation from Zow Pow Toys. Their Tiny Plane game controller is essentially a plush toy with connects wirelessly to its own game (which you can purchase for iOS devices through the App Store and then send to your television via Apple TV or similar). It differs from standard remote controls for gaming in that there are no buttons to press. Whatever the child does with the plush plane is captured wirelessly and mimicked onscreen. No more older siblings in the background screaming, “PUSH A AND B TOGETHER!” – and as far as I’m concerned, that’s a big plus for family harmony! Zow Pow have another plush character in the making, who is due to be released with its own game in the next few months. The Tiny Plane controller is US$24.99 from Zow Pow Toys and the Tiny Plane game is US$0.99 from the App Store. Check the Zow Pow website to make sure your device is compatible. What do you think Babyologists? Is this something you would go for at your place?